I will be back at the Cornelia Street Cafe next month for a set of new music on Wednesday October 14th, at 9:30pm. Andrew Gould, Isaac Darche, Or Bareket, and Christian Coleman will be joining me for the evening. I’m happy to share the night with John Raymond, his quartet will start the night off at 8pm. I will be playing with the Hellgate Horn Company as we join the Bone Chimes for a set at Arlene’s Grocery on Tuesday September 22nd at 10pm. I will be back at the Garage restaurant on Thursday August 27th with Lauren Falls on bass and Austin Walker on drums from 10:30pm to 1:30am. I will be back at the Garage restaurant on Thursday August 13th with Lauren Falls on bass and Austin Walker on drums from 10:30pm to 1:30am. As you may have noticed, things look a bit different around here. After a couple of years of my previous website design I decided to make a change and I’m very happy with the design work of James Yardley in helping me put this new site together. 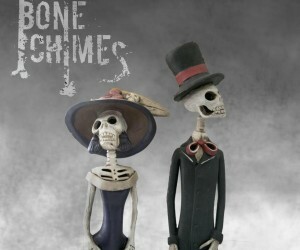 The Bone Chimes’ new EP is now available on iTunes, featuring five tracks recorded at Virtue and Vice Studios. Since I joined the group in the spring of 2013 this band has been making some great music. Tobi D’Amore, lead singer and guitar, also wrote all of the songs on this EP, and the horn arrangements are courtesy of keyboardist/saxophonist Ben Dobay. Hope you give it a listen. Cover art by EdenHill Photography. 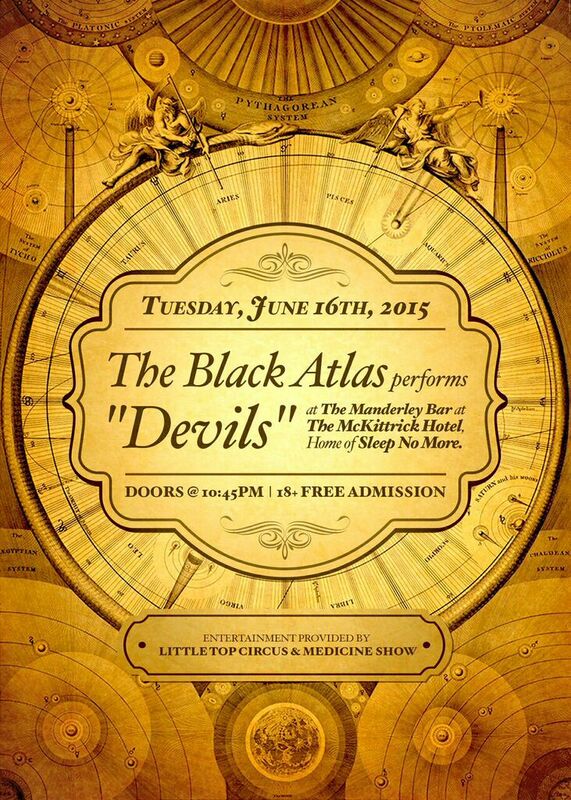 I will be joining Black Atlas for a performance of their new EP, “Devils”, on June 16th at the McKittrick Hotel. 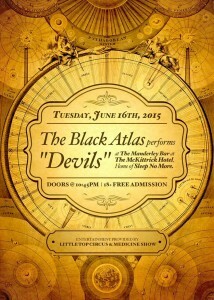 Doors at 10:45, after that night’s performance of Sleep No More. 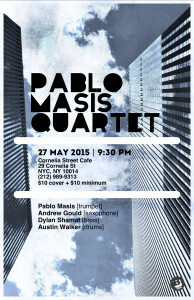 My quartet will return to the Cornelia St. Cafe on Wednesday May 27th to present a set of new compositions written while I was in Afghanistan this February. The Bone Chimes have released their new single, “Precious Curse”, off their forthcoming new EP. I am proud to have been a part of this track, you can listen to it here. I will be giving a workshop with the students of Rocky Mountain College in Billings Montana on March 14th at 2pm. This event is free and open to the public. I’m proud to announce that I will be joining the Afghanistan National Institute of Music in Kabul as a guest artist during their Winter Academy this February. This will be my first trip to the region, and I am honored to be joining such a talented faculty and hard working students for this event. I will be bringing some new music to Cornelia Street next month on January 20th. 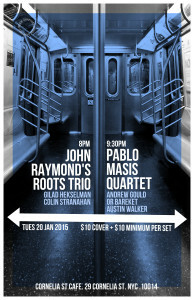 John Raymond will lead his “Roots” Trio for the first set, after which my new quartet is on for the second set. I will be joined by Andrew Gould on sax, Or Bareket on bass, and Austin Walker on drums. Starting at 8pm, with a $10 cover and $10 minimum. The 2014 Thelonious Monk Trumpet Competition has finished, and the winner is the incredible young player Marquis Hill from Chicago, with Billy Buss in second place and Adam O’Farrill in third. The entire lineup of young players competing this year was stellar, and I encourage you to head over to youtube and check out all of the performances here. Big thanks to Christopher Cooke at KIOS FM in Omaha Nebraska for his review of Rubicon. What an interesting month it has been! Now that Rubicon has been released and is out in the world, I have turned my attention to a new project, working on music for a larger ensemble than any of my previous recordings. More about that soon! I was also happy to join the Bone Chimes this month in recording their next single. Sounds great! Finally, check out the new release by Avishai Cohen, Dark Nights. It’s fantastic. 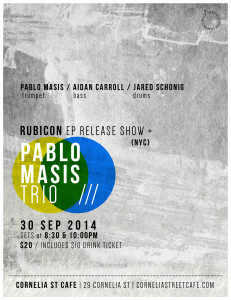 Rubicon release concert September 30th! 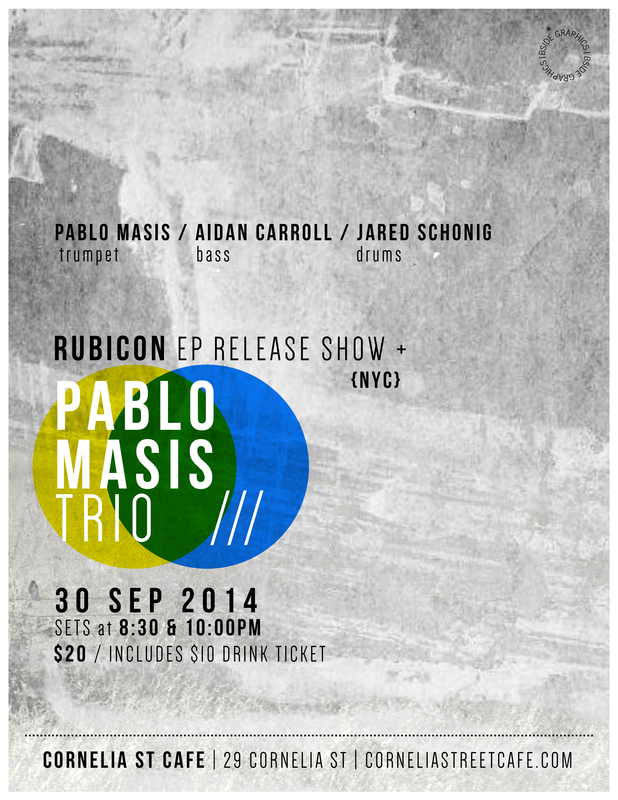 I am very happy to announce that my trio will present a night of music at the Cornelia Street Cafe on September 30th to celebrate the release of Rubicon. Starting at 8:30pm, both Aidan Carroll and Jared Schonig will be joining me for a fantastic night of music from the new album. Cover is $20 for the evening and includes a drink ticket worth $10 at the bar. I hope you will be able to join us! I will be joining the Bone Chimes for a show at the Music Hall of Williamsburg on August 25th. 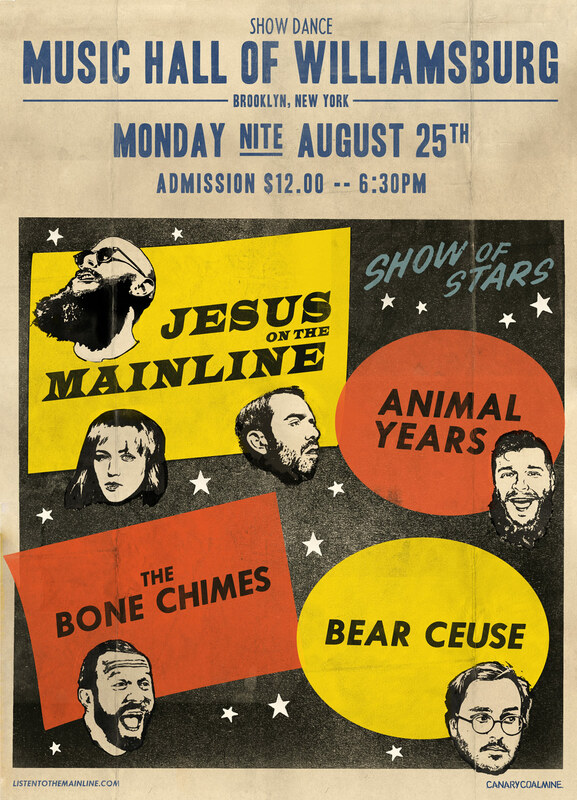 We will be opening for Andrew Neesley’s great band Jesus on the Mainline. Advance tickets are available from Ticketmaster here. I will be joining 90 other trumpet players on August 2nd to perform Craig Shepard’s “Trumpet City” for the NYC Summerstreets event. We will be performing Craig’s work from 11:30am to 12:30pm, rain or shine. More details about this piece can be found here. For those of you that would like a hard copy of my new recording they are now in stock at CD Baby. The design of the cover was done by Kyle Walters, who also designed the cover of my previous album, “Intrinsic”.